Btw, I don't recommend that as preferred way because it looks like code smell and there is a chance of error if there is more argument e.g. 10 + 10 + "" will produce "20" and not "1010" because + is right associative operator and it will first perform addition of 10 + 10 and then String concatenation between 20 + "". It's no doubt my favorite way for int to String conversion because you can use the same approach to convert other data types to String as well e.g. you can call String.valueOf(long) to convert a long to String, String.valueOf(double) to convert a double value to String and String.valueOf(float) to convert a float value to String in Java. String two = Integer.toString(20); // returns "20"
String one = Integer.toString(01); // returns "1"
You can pass this method a signed int value but it will preserve sign only for the negative number. Even if you pass +7, it will create String as "7" without plus sign. String hexa = Integer.toString(20,16); // "14"
String ocatal = Integer.toString(20, 8); // "24"
String binary = Integer.toString(20, 2); // "10100"
So, if you want to convert int to String in the different number system, you can use Integer.toString() for that purpose. 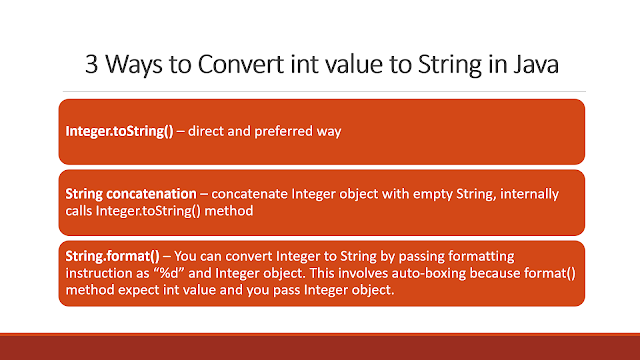 This is the easiest way to convert an int primitive to String object in Java. All you need to do is concatenate the int value with an empty String e.g. "" + 100 and this will return "100", no error, no issue, simple and easy, but I don't like that in production code? Why? isn't it most readable as well? yes, it does but somehow it looks like a hack to me than a proper solution. another reason is that it internally uses StringBuilder for concatenation, which means one more temporary object for GC to cleanup. Nevertheless, if you like you can use this approach, especially during testing. It's especially useful for converting large int values to String. For more examples of formatting String in Java, see here. Here is our sample Java program to convert an int primitive to String object. In this example, you will learn all three ways and one bonus way.